An individual dialog can be opened for each locomotive. By double clicking on a table line in the Loco panel or a Loco image of the Loco Widgets (if activated) opens this dialog. This dialog can be opened several times. Enlarging the dialog also widens the buttons. Longer names of the function keys are then easier to read. 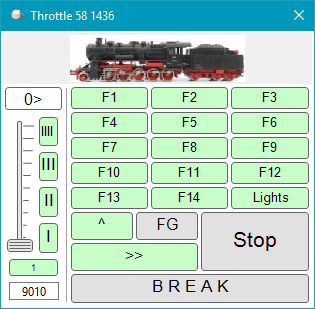 If Rocview is ended, and one or more Throttle dialogues are still open, by default the positions and the chosen locos will be restored at next start. This can be deactivated in the Rocview Configuration. E03 is selected in this example screen shot. Set the loco speed to zero. If the loco is running in automode this will activate the pause which will reject any further speed commands. This is made visible with the red dot in the upper left corner of this button. With a second click on the STOP button the pause will be ended. The direction image is used to flip the running direction. When the arrow points to the right means forwards; See screen shot. The button under the slider can be used to switch between the primary and secondary decoder address. It is only enabled if the secondary decoder address for the selected loco has been set > 0. This concerns only the speed; The functions will not swap decoder address. Note: The keyboard focus must be in this field to process the Enter events. Normally a text cursor is shown when the focus is set in this field. The buttons represent those in the Loc-Interface defined speeds.